There are many ways to leverage Messenger Marketing as a strategy; and with tools like Manychat or Chatfuel, this makes it easier for anyone to hop on to. But what happens when it is used in conjunction with a competition on Facebook to drive more engagement and awareness of the brand? Ok, now that’s a mouthful. For marketers who might think this is a new digital marketing term, don’t panic. It isn’t. But the truth is someone has said this in one breath. The buzz phrase is Conversational Marketing. Simply, it’s a way for marketers to leverage messaging apps as a vehicle to execute marketing activity. One way is to use chatbots, and the term expands to Messenger Marketing if it’s specific to Facebook. Now, I can start listing down the different ways to do this but I’d like to focus on a popular one – Chatbot Comments. Just one comment on a Facebook business page’s post can trigger an automated message, sent to the user via Messenger. The chatbot takes over, and as a policy, the user needs to opt-in by interacting with it through a button or a simple reply. And the rest of the messages come in. The marketer now has permission to send more messages and will attempt to converse with the subscriber. Clever isn’t it? This tactic is widely used and very effective when your objective is to generate leads. It’s also great to move your social media followers to a more personalised space so you can nurture them instead of relying on just numbers. Putting a face (and a name too) on a number is definitely better. You can segment them better and create a more personalised experience. But, what happens when a raffle prize is used as a sweetener to bring them in and eventually send generic conversations? I saw a post in one of my many Facebook groups asking about a competition that led her to enter via a private message. Clearly, it was a chatbot comment tactic and some have chimed in to explain what it was. By typing the keyword ‘WIN’, this triggered the chatbot to send the first message. If you look at the screenshot, all it asked was her to type in ‘yes’ to confirm her entry. Marketer – 1. User – 0. It wasn’t clear that when she types in ‘yes’ that she would also be a subscriber and agrees to receive future broadcasts. It would’ve been good practice to do so. Someone has probably missed the GDPR memo. One can argue that there she can unsubscribe by typing ‘stop’ but a bit of trust has been chipped off and questions arise. Sure, as marketers, Facebook’s policies and current algorithms make it difficult for us to promote competitions. We try to be more creative and some even try to game the system. 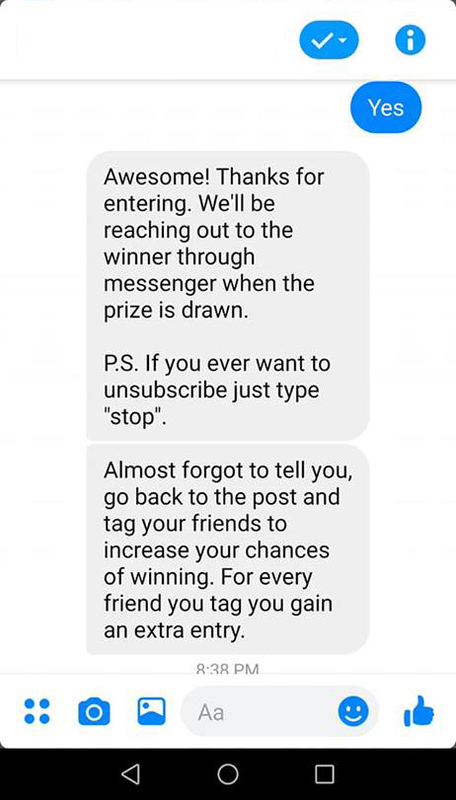 The last bit of the message them suggesting to tag a friend on the post to gain an extra entry is questionable and is against the policy since Messenger is a Facebook app. 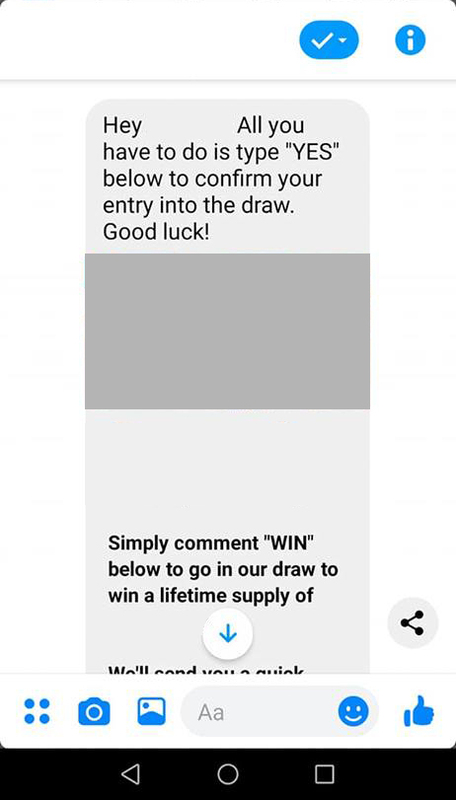 I would even question how they would know how many entries the person has, or how it assures an increased chance of winning. Let’s look behind the scenes, shall we? Since the chatbot is triggered by a comment, in this case, one keyword – win, then tagging a friend won’t trigger new messages. Then the question is how will they count the extra entries? Will this be done manually? A bit of a time-waster, don’t you think? If it’s set up with no keywords and will allow any comment (including tagging a friend) to trigger the chatbot, then imagine if you have 5,10 or more friends to tag! You’d be receiving the same message over and over and over again. There is also the possibility of just tagging friends in one comment, to avoid getting it numerous times. Which now goes back to my first point – how many entries do you then get? So, it’s either you realise you only have one entry despite the tagging, or you unsubscribe and block the page from sending you more messages. But, wait! What if you win, and by unsubscribing, don’t receive the notification? It is quite a conundrum! Would you trust a business’ chatbot again? Probably. But I won’t be surprised if you’d hesitate the next time you encounter another one. It’s a shame really since I’m an advocate of leveraging chatbots in marketing: it is powerful and effective. Having an automated digital assistant to help you achieve your objectives is a no-brainer. Unfortunately, some marketers are focused on the short-term gain and miss the whole point of good customer experience. Here is a technology that will help us scale, get back our time to focus on higher level tasks, and a chance to truly connect with our customers. Yet, we still haven’t changed our mindset on how conversations work in this new form of marketing. It’s about time we prioritise what matters most – a positive and personalised experience. If you want to know more about how to delight your customers through chatbot marketing, join one of our webinars. It’s always a pleasure to share my knowledge for a better marketing journey for our audience.